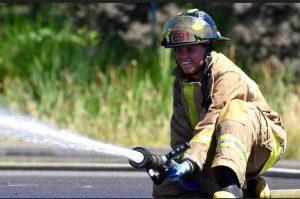 Applications are being accepted for the 10th annual Portland Metro Fire Camp for women ages 16 to 20. This free fire camp will be offered twice this summer on two weekends. Participants will learn what it takes to be a firefighter while completing hands-on training in hose and ladder skills, vehicle extrication, search and rescue, ropes and knots, live-fire operations, aerial ladder climbs and other firefighting tasks. They will also receive instruction from professional firefighters on how to prepare for interviews and gain insight on what it is like to have a career in the fire service. The deadline to apply is June 10, and applicants can select from two camp options this year. The first camp will take place July 13, 14 and 15 at the Portland Fire & Rescue Training Center, 4800 NE 122nd Ave., in Portland. A second camp will be held August 10, 11 and 12 at the Tualatin Valley Fire & Rescue Training Center, 12400 SW Tonquin Road, in Sherwood. Applications and more information are available online at portlandoregon.gov/fire/firecamp.